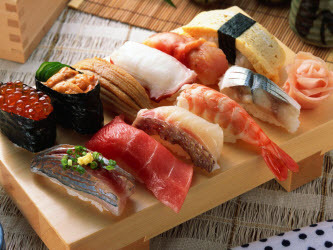 Sushi Supplies | Supplies You will need to have to make Excellent Sushi at Home! and probably even more enjoyable! For anyone wanting to make their own Sushi, having the proper sushi supplies on hand will be a requirement at some point or another. Some items will be required while others will be optional. And still others could be either---based on how serious you are about sushi making in general. But does it make a difference in the quality of rice that you make? Some would say "Yes", while others would say "No". I don't think the taste will really be different if you can cook the rice properly and consistently every time. With a pot, that will be a little more difficult than with a Rice Cooker. Go here to see how you use a Rice Cooker to make Sushi Rice. 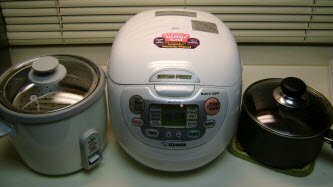 To learn more about Rice Cookers in general, visit our Rice Cooker page. The Hangiri is a round, flat-bottomed Japanese wooden tub used to mix hot Sushi rice with Sushi Seasoning (typically made of Rice Vinegar, Sugar and Salt). They are designed to aid in the quick cooling of the rice when mixing it with the sushi seasoning, which results in better overall sushi rice by making it shinier and keeping it firmer; both characteristics of good sushi rice. The advantage of using a hangiri as opposed to a bowl is mainly due to the hangiri's large diameter size which allows the rice to be spread over a larger area, generally speeding up the cooling process and the evaporation of the sushi seasoning. Truly one of the nicest of the optional sushi supplies to have on had. I use one every time I make sushi rice. To learn more about a hangiri, visit our Hangiri page. To get one, you can look at some here. When it comes to sushi supplies, nothing makes a statement like a high quality sushi knife. Sushi chefs value their knives as much as samurai warriors would have valued their swords. And, ironically, good sushi knives today are made from the same steel that was used to make Japanese swords. These knives are extremely sharp, allowing the sushi chef to slice sashimi without tearing the meat, so that it will have a clean, precise and pleasant appearance. Now obviously one can slice sashimi using a sharp, standard kitchen knife. But it won't (or can't) be as precise or clean as a sushi knife. I will guarantee you this though...once you have owned and used a high quality sushi knife, you will never go back. This is not only about love of the food but also love of the craft. And a sushi knife is one of the most important assets to have in achieving that. And also, a lot of the joy of sushi in general is not just about making and eating sushi rolls and sashimi; but it is also in the creation of art with your presentation by giving it beauty, symmetry and balance. To learn a lot more about Sushi Knives, visit our Sushi Knife page. If you intend to try your hand at making sushi rolls, you will have to invest in a Sushi Mat. This is one of the sushi supplies that you cannot do without. Fortunately, they are not very expensive and easy to find. Amazon has a good selection. 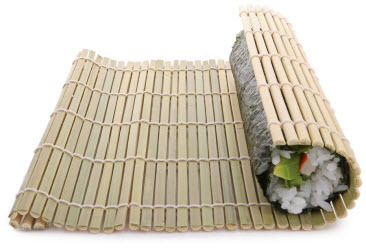 Sushi Mats are made of bamboo sticks woven together with cotton string. They must be cleaned and dried thoroughly after use or they will attract mold. To learn a more about Sushi Mats, visit our Sushi Mat page. 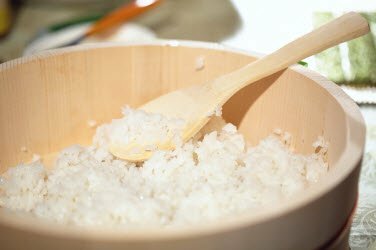 One of the most important of the sushi supplies to have on hand is either a plastic or wooden rice paddle to turn and scoop your rice for making Sushi. Both plastic and wood helps to prevent you from scratching the non-stick surfaces that coat most rice cooker containers so they will last as long as possible. Most of the time you will get a Rice Paddle with a rice cooker if you buy one, but if you are going to use a pot to cook your rice, you should buy a Rice Paddle separately. Visit our Rice Paddle and Shamoji page for more information. A Sushi Mold can be a helpful and useful kitchen tool to have around when its sushi making time. Some people won't use a mold and prefer making their Sushi either by hand, but I think its at least worth a try to see which method you like best. You may end up using a combination of both methods. 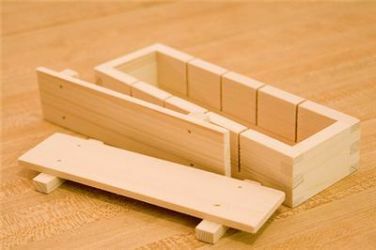 The sushi mold shown in the picture above is for making "Oshizushi" or "pressed-sushi". To make that, you will have to have that kind of a mold. There are many different kinds of molds available. Like ones for making Nigiri, Onigiri (rice balls), and Oshizushi (pressed sushi). The first two of which are optional. There's so many in fact that we've created a Sushi Mold page in case you want to know more. Half of the fun of Sushi is when you are making it... The other half is when you are finally done and you get to eat it! In Japan, presentation is very important. And so, the Sushi Plate that you serve your sushi on will play a huge factor on that first "impression" that your sushi makes when you serve it to your guests or family. If you want to find out more, visit our Sushi Plate page. 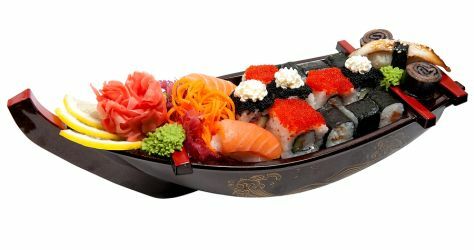 The Sushi Boat is a unique alternative to using a Sushi Plate if you really want to dress your sushi to impress. They come in all kinds of sizes and styles. Take a look at some here. If you want to know more, visit our Sushi Boat page. What kind of Sushi eating experience would it be without a pair of real chopsticks? Honestly, for the full sushi experience you should invest in a pair. But you don't know how, you say? 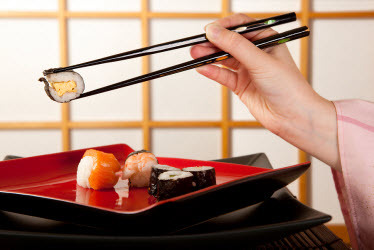 Visit our Chopsticks page for more interesting info and some tips on using them too! Your Sushi Refrigerator is probably the single most important piece of equipment in your Sushi Restaurant. 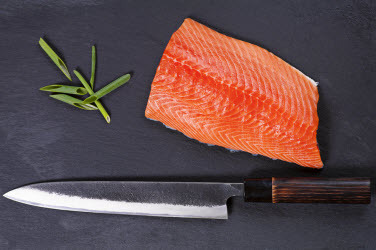 With all of the concerns from the public about sicknesses from salmonella and the freshness of Sushi Grade Fish it is something that deserves your utmost care and caution before making a selection. To learn more about Sushi refrigeration and equipment, visit our Sushi Refrigerator page. 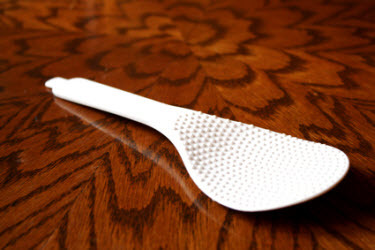 Do You Use a Utensil, Piece of Equipment, or Other Sushi Supplies that You'd like to tell Us about? Tell us what you like or don't like about it, how you use it, and if you think others would benefit from having it. Your ideas and contributions are important and welcomed! You can tell others why you like the item, what it is used for, how it improves your sushi making experience... Anything you want to talk about.